President Donald Trump and NATO Secretary General Jens Stoltenberg both gesture during their bilateral breakfast Wednesday in Brussels. BRUSSELS – President Donald Trump aired his grievances against one of America's closest and most powerful allies on Wednesday, deepening the growing rifts on the North Atlantic alliance and setting a contentious tone for a summit of NATO leaders who have pledged to defend each other in the event of an attack from Russia. And he did it all over breakfast. Trump's guest: NATO Secretary General Jens Stoltenberg. "I think the Secretary General likes Trump," the president said, before sitting down in the dining room of a diplomatic mission in Brussels. "He may be the only one, but that's okay with me." But the moment they sat down, it became clear that Trump did not come to Brussels in a conciliatory mood. "Good morning to the media – the legitimate media and the fake-news media," Trump began. With cameras whirring in unison, a reporter asked Trump which countries he thought should be paying more for the collective defense of NATO. "Just look at the chart. Take a look at the chart. It's public. And many countries are not paying what they should," Trump said. "So something has to be done, and the Secretary General has been working on it very hard." 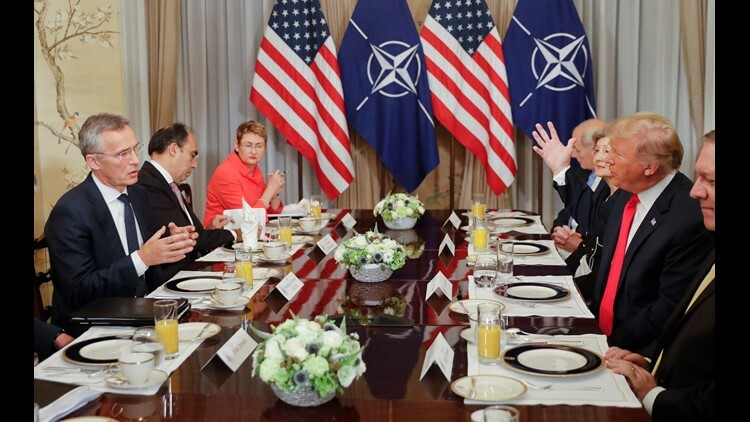 Stoltenberg, sitting directly across from Trump at the breakfast table, said NATO allies had reversed their post-Cold War declines in defense spending and were now engaged in the biggest military buildup in a generation. "And why was that?" Trump asked. "It's also because of your leadership," Stoltenberg said. "They won't write that, but that's okay," Trump said, nodding to the press. Soon, Trump was no longer addressing the media but looking directly at Stoltenberg, using him as a stand-in for German Chancellor Angela Merkel. He complained about a gas pipeline linking Russia to Germany that the German government approved. "Germany is totally controlled by Russia, because they will be getting from 60 to 70 percent of their energy from Russia and a new pipeline," Trump complained. At the end of the table sat Chief of Staff John Kelly, who began to fidget as Trump went after Germany. He took notes, straightened his tie, adjusted the napkin in his lap, scooted his chair and looked away. White House spokesperson Sarah Sanders later said that Kelly "was displeased because he was expecting a full breakfast and there were only pastries and cheese." As Trump continued his harrangue, Stoltenberg diplomatically attempted to bring Trump back to what was supposed to be the theme of this year's NATO summit. "Strength and unity." "You know, NATO is an alliance of 29 nations, and there are sometimes differences and different views, and also some disagreements," the secretary general told Trump. "And the gas pipeline from Russia to Germany is one issue where allies disagree. But the strength of NATO is that despite these differences, we have always been able to unite around our core task, to protect and defend each other, because we understand that we are stronger together than apart." Trump shot back. "But how can you be together when a country is getting its energy from the person you want protection against or from the group that you want protection?" "Because we understand that when we stand together, also in dealing with Russia, we are stronger. I think what we have seen is that – "
Trump interrupted. "No, you're just making Russia richer. You're not dealing with Russia. You're making Russia richer." "Well, I think that even during the Cold War, NATO Allies were trading with Russia," Stoltenberg said. "I think trade is wonderful. I think energy is a whole different story. I think energy is a much different story than normal trade," Trump said. "Germany, as far as I'm concerned, is captive to Russia, because it's getting so much of its energy from Russia. So we're supposed to protect Germany, but they're getting their energy from Russia. Explain that. And it can't be explained – you know that." With that, reporters were escorted out of the breakfast. "We have a tremendous relationship with Germany," he said. "But we'll see what happens over the next period of a few months." Merkel, for her part, said only that she was "very pleased indeed to have this opportunity for an exchange of views." 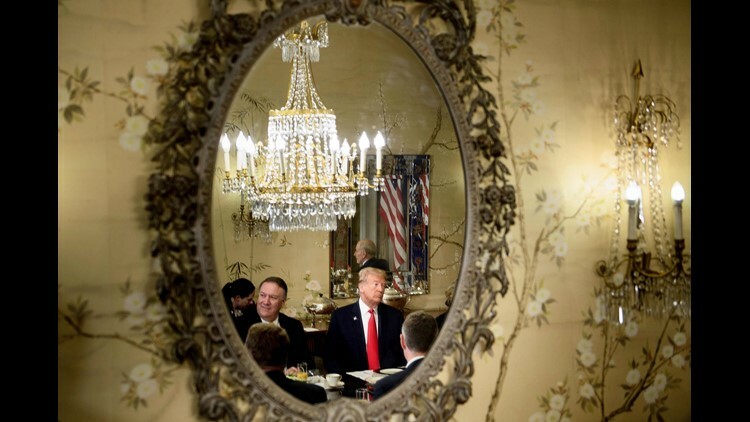 President Donald Trump Secretary of State Mike Pompeo are reflected in a mirror as they attend at a breakfast meeting with the NATO Secretary General and staff at the US chief of mission's residence in Brussels Wednesday.